Sometimes I follow my eyes towards a perfume, and sometimes that leads me to something nice and worthwhile. 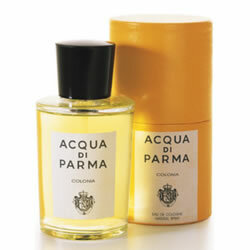 Acqua di Parma is such a line, where what I saw interested me more, than what I expected to smell. That may be a Perfumista sacrilege, but it is the truth nonetheless. I’m going to take a look at three classic colognes today. There is a fourth – Colonia Assoluta – that I haven’t got a sample of (yet). It is a composition of Jean-Claude Ellena and Bertrand Duchaufour, so I think it warants its own review on the strength of that information alone. The elegant, clean and classic style of bottle and packaging are undoubtedly a success with me. But how does it smell? Colonia is a classic cologne, totally unisex in my eyes. Colonia includes notes of Sicilian bergamot, lemon, bitter orange, lavender, rosemary, verbena, clary sage, Bulgarian rose, sandalwood, vetiver, cedar wood, patchouli and oakmoss. Opening strong and bracing with sharp citrus notes, herbal green notes soon take over. Rosemary and clary sage over verbena, with a smidgen of rose thrown in to keep the composition from being too harsh and masculine, constitute the heart of this perfume. It lingers for a long time, thanks to the balanced base of vetiver, patchouli and woods. Colonia is by far my favorite of the three. Over 95 years old – Colonia made its debut in 1916 – this classic is wearable and timeless. In this case, the visual presentation and the juice it harbors, are good match for me. Great year-round as a quick pick-me-up that doesn’t require thinking or a special mood, Colonia can be a staple in anyone’s perfume wardrobe. Also available is an entire body product range, therefore making Colonia the perfect gift for men and women. 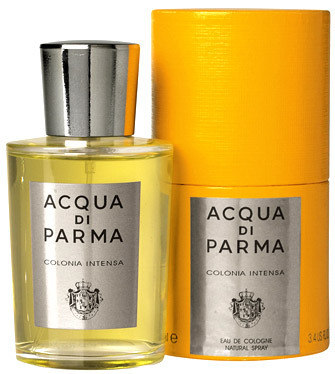 Colonia Intensa is a more recent addition to the line, and one whiff makes it clear that this is not intended for unisex use, it is geared towards the men’s market, probably as a counterpoint to the women’s line I already reviewed – I Nobili. Colonia Intensa includes notes of bergamot, lemon, cardamom, ginger, myrtle, mugwort, neroli, cedarwood, lignum vitae, patchouli, benzoin and musk. I don’t like the super-butch, “I’m a man!!! !” – opening at all, although it might be good on a man who likes this kind of reinforcement, I suppose. Colonia Intensa is not just an intense or longer-lasting version of Colonia, it is an entirely different perfume. More woody and leathery than Colonia, the drydown is actually very interesting, with a lot of benzoin sweetening up the cedar and patchouli base. Grapefruit, Tangerine, Bergamot, Lemon, Petitgrain, Neroli, Rosemary, Jasmine, Lily of the Valley, Rose, Clove, Vetiver, Patchouly, White Musk and Ambergris are the notes listed for Colonia Essenza. This is the most recent launch of 2010. Essenza is presented in a black bottle and is supposed to reprise the classic Colonia in a modern way. Well, it sure does that, and we all know, very often that is not something to be proud of (especially not, if coming from LVMH, who bought Acqua di Parma in 2003). Sadly this is the case here as well. Essenza smells cheap, like a shower gel at best. What remains of the scent after ten minutes, is a vague, bordering on unpleasant, soapy musk, that puts the pretty bottle and the good name of Acqua di Parma to shame. My advice – stick with the original! 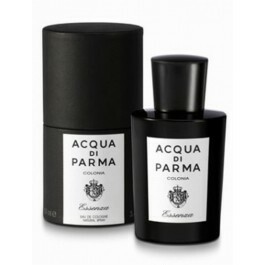 This entry was posted in Acqua di Parma, Citrus, Cologne, Fragrance Reviews and tagged citrus, cologne, Colonia, Fragrance, Perfume, Review. Bookmark the permalink. Hmmm… ‘Cologne’ is my least favourite perfume genre, but perhaps that is because I’m yet to have found one that resonates with me (I love Mugler Cologne but I don’t think that counts). Colonia does sound like it is worth a try and I do need to explore the Acqua di Parma line after your review of the ‘Nobiles’, Iris Nobile in particular. I have some sniffing to do! P.S. I hope you’re having a lovely time in NYC! Hope you had a fabulous Thanksgiving Day! I like the original Colonia. It’s high quality with lots of “zing” and more substance than most cologne-style fragrances. I should think it’s great in hot weather. Yes, we did, even though most of it was spent on the plane. Colonia is great in summer! Ah, the Guerlain colognes, so lovely! I actually like the short lived refreshment of a good cologne from time to time. I don’t know why but this brand has never interested me. I will try Colonia when I have a chance but those AcP’s perfumes I tried so far didn’t make me a fan of that brand. I’ve tried. Colonia, it was one of your generous samples, but unfortunatly it absoltly didn’t work with/on me, nothing of the things you described, actually it smelled like naftalin on me, and I wanted to get rid of the smell on me immediately, a pity cause I really love the classic appeal of adp very much and yrs ago I fell in love with their Mediterranean cypress scent……but unfortunatetly. The classic doesn’t work with me, hooe you and the h.are enjoying yourself in nyc…. 😀 😀 Too funny, Birgit. Hope you’re having fun in NYC. 😀 I am, it went by way to quickly though, now I’m at the airport already, all set to fly back home. Hi, B. Nice reviews. I’m a fan of several AdP scents, and a couple of the Colonias. Intensa was actually my first, and I don’t find it “super butch” at all (maybe because I’m a man?). It is definitely far more woody and spicy (nutmeg?) though, and less like a typical eau de cologne. I don’t remember if I’ve smelled the original, but I do have decants of Assoluta and an Assoluta “Riviera Edition” LE (which is slightly more floral, I think). I love them and look forward to your reviews. They were just perfect for me during some warm weather this past summer. Essenza I only smelled once in a shop, but I thought it seemed quite nice also, and again similar to a classic cologne. Maybe I would feel differently if I gave it a longer amount of skin time; I wouldn’t mind getting a small decant. I’ve been interested in this line for a while. I have suspected that the original Colonia would be the one I would favor the most. Your reviews reinforce that thought to me. I should stop delaying and start looking for a sample. Enjoyed reading these reviews. Thank you, Jim. The original Colonia is really nice and I hope you will enjoy it! Colonia is one of my summer favorites too. It just smells so clean, like hot fresh laundry clean, that it makes you feel fresher even when you are hot, sticky and sweaty. Like in today’s NYC heat wave! Sorry to spoil the party but how did Essenza manage to be crowned mens fragrance of the year a couple of years ago if its so cheap smelling and vulgar ? Well, Pavlo, there is something for everyone and taste is and always will be personal and subjective. I’m sure there are many who like Essenza and more power to them. I’m sorry if my opinion on the fragrance offended you, that is never my intention. No offence taken….the interplay between our personal tastes and what we can all detect in a fragrance is interesting. The whole adp range leaves me baffled. They can all (at different times in their openings and drydowns) give pleasure and yet I never feel inspired enougth to take any of them home with me. Maybe the packaging is making me feel that I should love them ? But no, they all have notes that I adore; maybe theres a rigidity in the structure that lacks passion and warmth. One other thing ! It might be easier for a lady to wear the original than a gentleman, that is, if the gentleman is relatively young then the lavender drydown might make him feel that he can always wear the fragrance again when hes older. The packaging is gorgeous and I fear it plays a big part in my own attraction to the line, which can’t be sustained in the long run though, as the juice is not what I would want for me after all.